ATLANTA, Georgia, August 1, 2013 (ENS) – The shipping giant UPS, or United Parcel Service, aims to chalk up one billion miles driven by alternative fuel/advanced technology vehicles by 2017, the company said on Monday, releasing its annual sustainability report. The fleet today includes all-electric, electric hybrids, hydraulic hybrids, natural gas (LNG, compressed natural gas), propane, biomethane, and light-weight fuel-saving composite body vehicles. The company said it is accelerating its testing, purchase and deployment of new-generation vehicles. Part of UPS’s environmental strategy is to support the development and use of lower-emission alternative fuels and new generation vehicles. Earlier this year, UPS announced plans to add some 1,000 liquefied natural gas (LNG) tractors over the next two years, expanding its current fleet of 2,700 alternative fuel and technologically advanced vehicles. “Currently, we have 112 LNG tractors in service. Most of these are Kenworth with Westport Innovations 15-Liter engines,” he told the Alternative Clean Transportation Expo, where one of the one of these tractors was on display. Company executives are proud of the environmental record over the 2011-2012 period detailed in the new sustainability report. UPS shipped more packages in 2012 than the year before, but the company reports it reduced its global greenhouse gas emissions from both operations and purchased energy by 2.1 percent compared to 2011. Ground and air fuel savings, increased investments in alternative fuel vehicles, and retooled routes that shaved 12.1 million miles from ground deliveries were documented in the company’s annual Sustainability Report, released Wednesday. The new Sustainability Report cites the greenhouse gas reductions, fuel savings and miles avoided through the innovative use of technology. In 2012, it shows, the UPS vehicle fleet drove 49 million miles, a 43 percent increase compared to 2011. 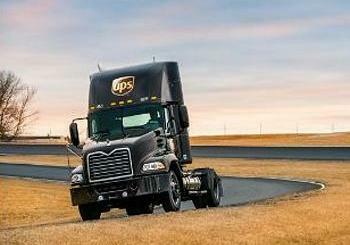 Telematics data fed through vehicle sensors helped UPS cut more than 206 million minutes of engine idling time last year, saving more than 1.5 million gallons of fuel. Routing technology increased pickup and delivery stops per mile, saving 12.1 million miles of driving which equates to approximately 1.3 million gallons of fuel. Vehicles represent roughly 35 percent of UPS’s carbon footprint – the rest derives from the company’s aircraft. The report shows that last year UPS Airlines reduced its fuel use and carbon emissions. Air shipping volume rose 4.8 percent year over year, while fuel use dropped 1.3 percent. Wicker is proud that for the second year in a row the company has earned third-party assurance of its report and greenhouse gas data accuracy from Deloitte & Touche LLP.